Last week I wrote a piece about how journalists have covered the speculation about Elena Kagan’s sexual orientation. What I found in my reporting was that the Fifth Estate has been talking at length about the rumors that say Kagan is a lesbian, while the mainstream media have hardly joined the conversation. 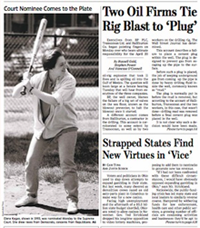 After Kagan's nomination, The Wall Street Journal ran a front-page photo of Kagan playing softball, prompting some readers to question whether the paper was playing off a stereotype. In a Politico story, the Journal denied such claims. I’m less interested in whether Kagan is a lesbian and more interested in the role that journalists have in acknowledging the discussion that people are having about her sexual orientation. The Fifth Estate has acknowledged the speculation. Should the mainstream media just ignore all the chatter? What’s the harm in addressing it? Some may argue that addressing it would distract from the news and the facts, but what if we turned that argument around and asked: How might journalists engage new audiences by fostering a dialogue about the chatter? How might they help their audiences understand some of the deeper issues that are making people so upset about the lack of information about Kagan’s sexual orientation? And how might this type of dialogue inform journalists’ understanding of other issues involving the LGBT community? These are just some questions I’ve been thinking about since reporting this piece. Feel free to share yours, too, in the comments section of this blog post.